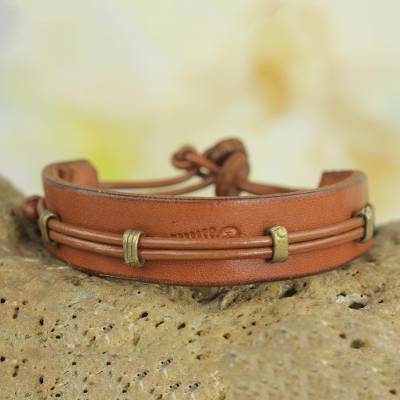 Handcrafted of natural leather with hand-hammered brass accents, this bracelet suits men and women alike. Artisan Gill Quarcoopome stamps each with the aya or fern, an Adinkra symbol for perseverance. Button clasp. The artist financially supports the children of her assistants with her earnings from NOVICA. In 1995, Gill was awarded first place in an international event hosted by UNESCO and received an award given to master artists. Gill has several employees that she still supports and pays the social security for them. My boyfriend does not like to wear jewelry, so I was a little worried after ordering for fathers day present. He opened it, immediately loved it! He has worn it since the day it arrived! TY for such a lovely design that even the pickiest man will happily wear! Love this bracelet ! Nice materials, cute style and well made ! But just not what I was looking for. Nice quality and workmanship. Cool design, good color. Unfortunately, the bracelet kept opening up, and eventually was lost, as it fell off his wrist. The leather bracelet my wife bought me several years ago finally wore out and fell off my wrist. I saw this bracelet in the catalog I received from National Geographic and fell in love with it. I love the look and feel of leather, and the design is unique and beautiful. I was very happy with bracelet and BOTWEY did a great job. "Very nice casual leather cuff"
Handsome addition to wrist wear collection. Unique. Literally everything I have purchased, from All different artisans and countries has been beautiful and well crafted. I recommend Novica to all my family and friends! Special gifts. "Leather wristband bracelet for men"
The crafting is nice however it is too small for a man?s wrist. "sMy husband loves this bracelet"
"Opportunities come up and sometimes we don't see them or don't want to take a risk but this is one way of moving forward – a leap in the dark." "I have always loved making things – from paper, cloth, wood, metal or anything to make something useful out of a basic raw material - and leather is such a versatile material. I started with soft leather scraps to make small purses and belts with jigsaw-like patterns and went on to experiment with different leathers for sandals. I have large feet so even at age 16, I was trying to make my own footwear. "When I was at University studying German and Politics, I was still making things to sell. I went to Greece after getting a rather disappointing degree and tried to learn shoe-making but ended up with an exciting holiday and a passion for leatherwork, rather than developing lot more skills. I learnt more back in England from an Irish friend and a short course in saddlery. "In 1975 I was working for a government agency but still making items in leather and was asked to demonstrate leatherwork at a 10 day craft fair in the north of England, where I was living. After that fair I was offered the chance to teach evening classes and the chance to rent a small workshop. So I decided to give up the security of my job, took a leap and haven't looked back. Opportunities come up and sometimes we don't see them or don't want to take a risk but this is one way of moving forward – a leap in the dark. "I exhibited at trade fairs and supplied boutiques. I also made items to customer specifications, from a telescope case, a motorcycle seat, or a medicine bag, to briefcases, bags, belts and sandals, from baby sizes to 48 men's using a range of 22 colors. "In the same year I met my future husband whose father had been a shoemaker in Ghana – an unlikely coincidence. He was working on the oil rigs in the far north of Britain and so I had a lot of time to myself to concentrate on getting a small business organized. "In 1989, we decided to try working in Ghana, his home, taking with us an 11 month old baby girl, most of my machines, and very little money. I had taken a course teaching English as a foreign language, so when we arrived I was lucky to find a job at the Ghana International School, all the while continuing to make leather bags, belts and sandals for sale to busy teachers. "He had a job in construction. My son was born in 1991 but I continued teaching until I left GIS in 1997. I still teach English privately and proofread manuscripts but the leatherwork is constantly there, playing a bigger or smaller part of my life. "Kofi Ansah, a fashion designer, encouraged me to decorate some belts for him with Ghanaian glass beads and brass figures. This inspired a style that has developed in many directions since his exhibition at the British Council in the early 1990s. I now use old trade beads, new recycled glass and plastic beads, bone beads and as well as brass beads, discs and animal buckles together with different textured and colored leathers. "Since 1999, I have been producing mainly for the local market but I am always happy to export. I haven't expanded my venture beyond three employees but am satisfied with this size. Having to deal with so many parts of a business can be very demanding, and after so many years producing, I still haven't found the right partner to work with. "When my husband died in 2007, a lot of people asked if I would go back to the UK, but now I am so Ghana based that the UK would be a cold, foreign land to live in. Although I visit family and friends as often as possible, I prefer the sun and warmth of Ghana, where there is freedom to create and experiment, especially with the vibrant colors and textures of cloth and beads that surround us. There is not a lot of free time, but I have the opportunity to swim whenever I can, enjoy the company of good friends, listen to jazz old and new, and explore creativity in whatever form." Quarcoopome signs her design with the Aya or fern Adinkra symbol, meaning perseverance and endurance. I'm proud to wear your beautiful wrist adornment. Thank you!